Update: This promotion is now over. Sorry to those that missed it! 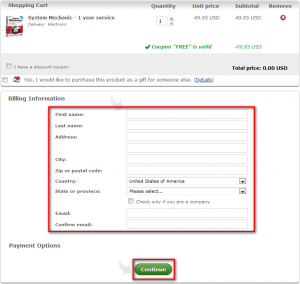 To not miss freebies in the future, be sure to subscribe to dotTech: E-mail  | RSS  | Twitter  | Facebook  | Google+ . Has your PC slowed down? Tired of bothering friends and family for help, or worse…hauling your PC to the local repair shop? To achieve maximum PC performance, a solution with a comprehensive set of tools to address each of the 9 root causes of PC slowdowns is required. 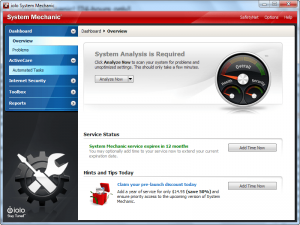 System Mechanic is the only product available that resolves each and every one. System Mechanic provides complete ease and flexibility to help you speed up your PC no matter what your experience level. Perform a complete cleanup in just three minutes. Automatically fixes hundreds of perplexing errors in just one step. Advice on this freebie isn’t hard. 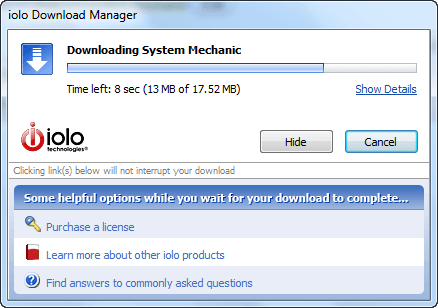 iolo System Mechanic is one of the most highly acclaimed system tune-up utilities out there. Sure no after-market tune-up utility is perfect; so it wouldn’t be fair for me to say System Mechanic will improve *all* computers. However, generally speaking, System Mechanic works very well. That said, system tune-up utilities may sound like the type of program everyone needs, but that really isn’t the case. People with faster, more modern machines will feel little to no speed/performance increase after running a tune-up utility simply because their machines are powerful enough to handle baggage without any hiccups. In fact I recommend people with new machines to not use tune-up utilities (until you feel your computer is “slowing down” after long time use) simply because the risk of malfunction – and no mater how good, every third-party tune-up utility has some chance of causing problems – is not worth the reward of little to no benefit. On the other hand, people with older machines – ones in use for more than a year or so – can typically benefit from allowing tune-up utilities to clean out the junk they have accumulated in their computers. In the end, it really just depends on you, your computer, and your computing habits if you need a tune-up utility. 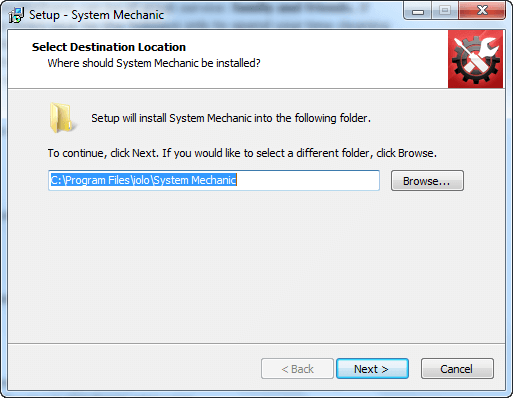 All I can say is iolo System Mechanic is one of the better ones — highly recommended. 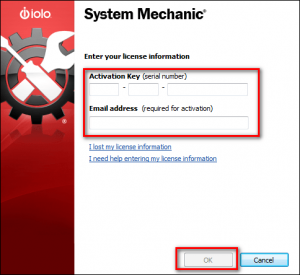 iolo System Mechanic is being given away in a promotion by Softpedia . 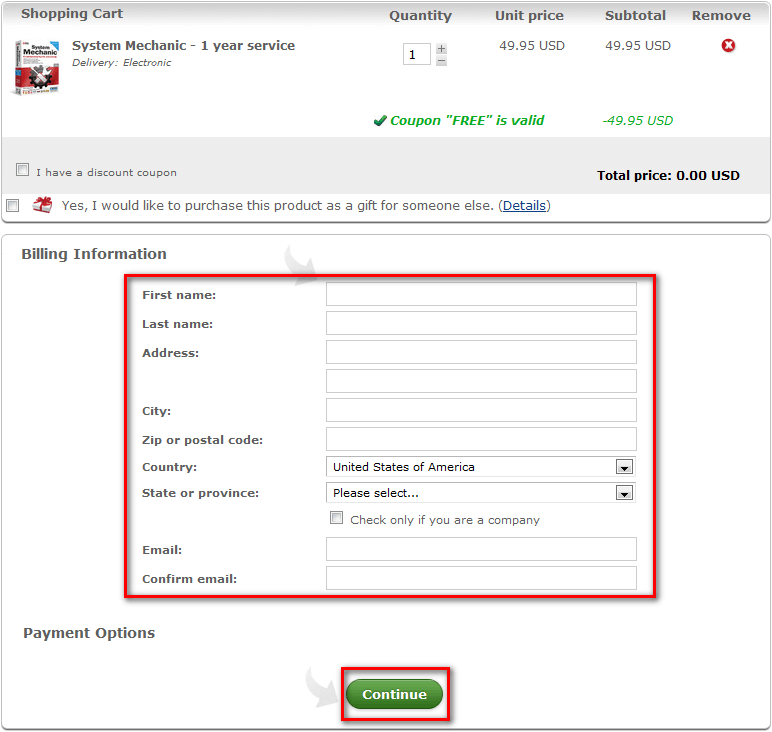 The promotion is live for 24-hours only but the exact start/end times are not specified; my guess is the promotion ends December 12, 2011 14:00 GMT. 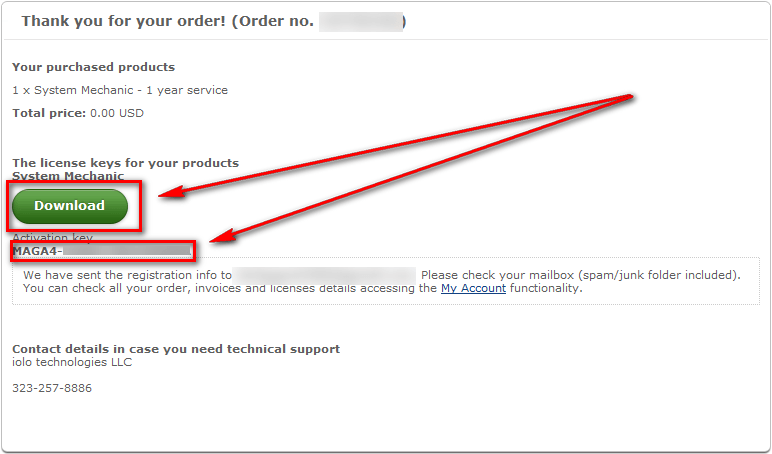 Also, Softpedia does not mention this, but the freebie is for System Mechanic “1 year of service”. 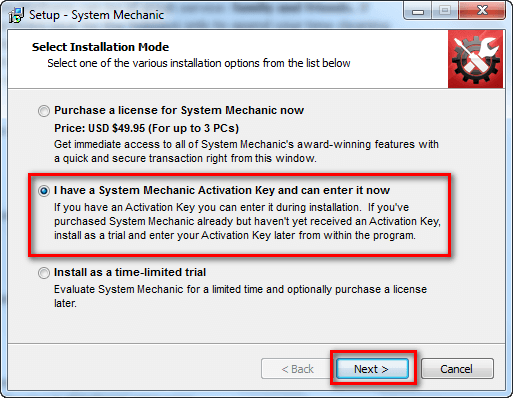 I am not sure if this means you can use System Mechanic for one year (in which case you would no longer be able to use it after the year has expired) or if you will get free updates for one year (in which case you could still continue to use System Mechanic after the year has expired but without updates). 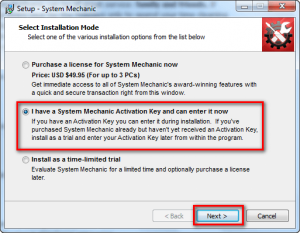 Furthermore, it looks like this promotion is being processed like a purchase (although you aren’t paying anything nor do you have to enter any payment details such as a credit card) so you should be able to install/reinstall whenever you want within the one year time-frame; each license is a 1-PC license so if you want it for more than one PCs you need to get multiple licenses. 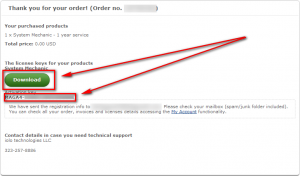 Hit Continue after you have filled out the form. 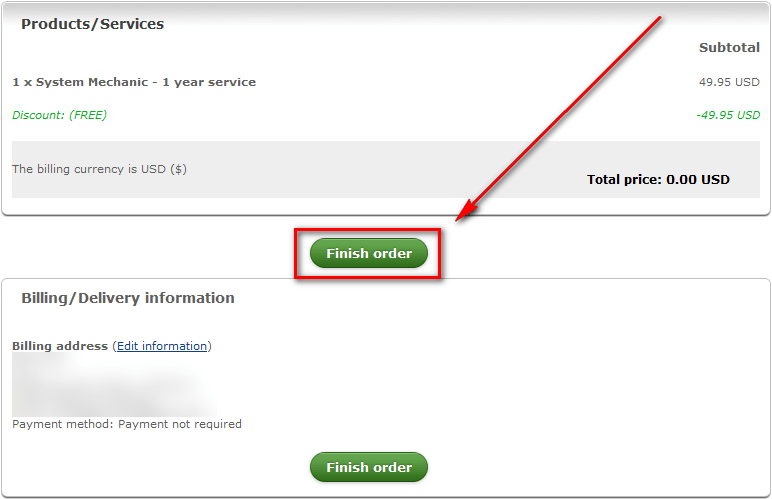 Hit the Finish order button. Update: iolo has changed how they process this freebie since I originally wrote this article earlier today. 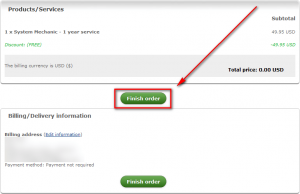 When I wrote this article, after you clicked the Finish order button iolo provided you with the download link and license key onscreen, as shown in this step. 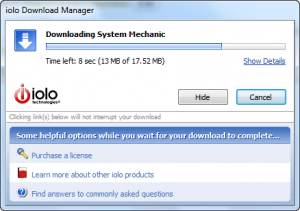 Now iolo is e-mailing users the download link and license key. So be patient and look for that e-mail. Once you get the e-mail, skip to the next step. System Mechanic itself is 17.52 MB. It is your choice if you want to save the installation file on your computer or not. If you are on a slow or bandwidth capped Internet connection, it is probably a good idea to save the installation file for easy re-install at a later date. If you are not, you can probably save yourself some space by not storing it. 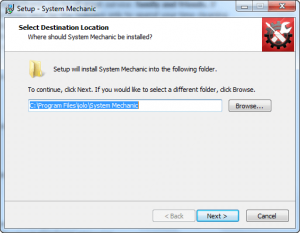 In any case, whichever you decide, after you click Yes and pick a location to save the file or after you click No, the installation of System Mechanic will automatically start. Continue to follow onscreen instructions and finish installing iolo System Mechanic. If you have any trouble getting iolo System Mechanic for free, post below and other dotTechies or I will try to help.